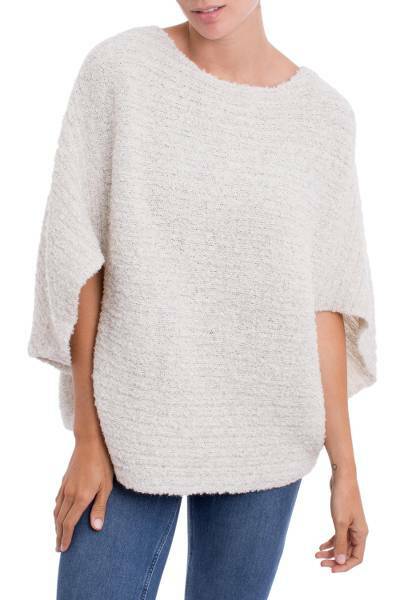 Ivory Alpaca Wool Blend Poncho with Arm Openings, "Texture Treasure"
This soft, ivory alpaca wool blend poncho with arm openings on the sides will quickly become your go-to layering piece. Rogelio Quispe of Peru creates this poncho with boucle yarn in subtle horizontal stripes, giving it a wonderful texture. You can find alpaca blend poncho 'Texture Treasure' by Rogelio Quispe in clothing categories such as Alpaca Wool Blend Ponchos, Alpaca Ponchos, Alpaca Wool Ponchos, Nylon Ponchos and Nylon Blend Ponchos. Enjoy exploring these sections for other Novica treasures. "Knitting is my passion. For me, it's an art and I decided to follow my dreams, along with my wife who works with me." "I'm an enterprising spirit and an honest man. I am very responsible with the quality of my work. I was born in 1979 in Peru's Puno province. "My grandparents were weavers. I grew up watching how they'd prepare the yarns and I found their work very attractive. I was always curious and wanted to learn then and there, so my grandmother became my teacher. When I was 17, I took a job in a bakery where I made new friends. When one of them had his own knitting workshop, I decided to work there. This is how I became a textile artisan. "Despite holding down other jobs, I learned to knit in Arequipa. Later, I moved to the capital where I worked in a knitting workshop for around two years. I learned a number of different stitches but the one I liked best was the intarsia method because it's different, interesting and more complex. I challenged myself to specialize in intarsia. "In 2010, I faced the most difficult time in my life. I had just opened my own workshop a few days earlier when my mother was diagnosed with cancer. She was quite fragile so I left my workshop to take her to Lima to the best hospital possible. She fought the disease for a year and a half but, finally, there was nothing more to be done. When she passed away, she took a big part of my life with her and my heart will never be the same. My wife and family were a great support during that time and they encouraged me to move ahead with my dreams. I know that's what my mother would have wanted. "To reach the point where I am today, it's been a long, tough road. But it has also brought me many rewards. My work improves day by day. Specializing and working in different textile shops gave me the knowledge and practice for my designs to stand out. Knitting is my passion. For me, it's an art and I decided to follow my dreams, along with my wife who works with me and is involved in all our processes. "I love designing and knitting alpaca apparel and accessories. It's fascinating to be able to create designs that complement the beauty of the women who wear them. My inspiration comes from Peruvian history, our outstanding Inca weavings and their importance in our culture. With my own art, I try to capture some of the most ancient textile traditions in the Andes."